WASHINGTON — A botched U.S. Air Force network upgrade that wasted $745 million dollars. American military equipment for Iraqis lost. Buy-American laws misinterpreted. 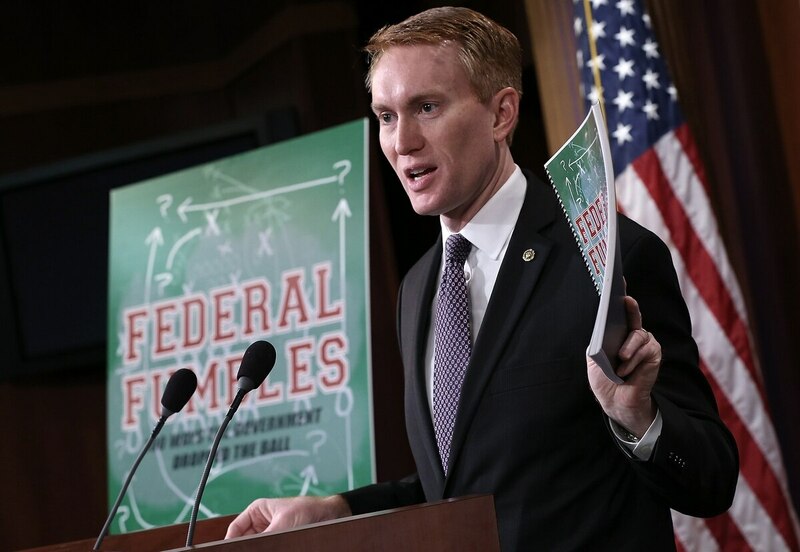 These are a handful of government blunders targeted by Sen. Jim Lankford’s latest “Federal Fumbles” report, released Monday. Lankford, R-Olka., sits on the Homeland Security and Governmental Affairs Committee. The report ridiculed dozens of examples of government waste, most outside the military, including $30,000 for a production of Doggie Hamlet and the IRS hiring back 824 people who were previously terminated. The Air Force, when it announced it would cancel the contract with Northrop Grumman, said it would partner with the Department of Defense’s innovation unit to find a quicker way to field the update. The DoD could not track more than $1 billion in equipment — including small arms, mortars and Humvees — the U.S. bought for Iraqi security forces, the agency’s inspector general found earlier this year. “Before allocating funds in the future, Congress should work with the DOD to put in place a system to track equipment from purchase to transfer and every step in between,” Lankford’s report says. Contracting personnel at the Defense Logistics Agency failed to comply with buy-American laws — the Berry Amendment — in 19 contracts, valued at $453.2 million, out of 32 contracts reviewed. The report spotlighted how the DoD’s Law Enforcement Support Office gave access to sensitive equipment to a fake police agency during a Government Accountability Office sting. The GAO concluded the DoD has inadequate controls for sensitive gear, like night vision goggles, simulated rifles and simulated pipe bombs. The widely reported incident was ammunition for opponents of the Trump administration’s restart of surplus military equipment transfers to U.S. civilian law enforcement agencies. Lankford, on the other hand, opined: “There is nothing wrong with the DOD disposing of unnecessary equipment and property.